Fire safety systems and equipment are essential for the safety of all the individuals of a country. The demand for fire safety systems & equipment in Saudi Arabia is likely to remain stable in future as these are inescapable and are installed across all the sectors. Oil & gas being the major sector of the country, surges the demand for fire safety systems and equipment. According to 6Wresearch, Saudi Arabia Fire Safety Systems and Equipment market is projected to grow at a CAGR of 5.6% during 2017-23. Fire Safety systems and equipment market has registered robust growth until 2014, however the market has declined post 2014 due to reduced government spendings across various sectors. The market is expected to recover post 2017 due to changing government policies to support establishment of new industries related to petrochemical, IT/ITeS, automotive manufacturing and development of public infrastructure. The Eastern Region accounted for the largest revenue share in the country in 2016, followed by the Western region. Major industries of oil and gas petrochemical are located in the Eastern region, hence leading to growth in fire safety systems and equipment market. The Western region would also witness stable growth owing to the development of tourism sector in the region. Some of the key players in Saudi Arabia fire safety systems and equipment market include- SFFECO, Heba, Tyco and NAFFCO. The report thoroughly covers the Saudi Arabia fire safety systems and equipment market by types, verticals and regions. The report provides an unbiased and detailed analysis of the on-going trends, opportunities high growth areas, market drivers which would help the stakeholders to device and align their market strategies according to the current and future market dynamics. • Historical Data of Saudi Arabia Fire Safety Systems and Equipment Market Revenues for the Period 2014-2016. • Market Size & Forecast of Saudi Arabia Fire Safety Systems and Equipment Market Revenues until 2023. • Historical Data of Saudi Arabia Fire Fighting Systems and Equipment Market Revenues for the Period 2014-2016. 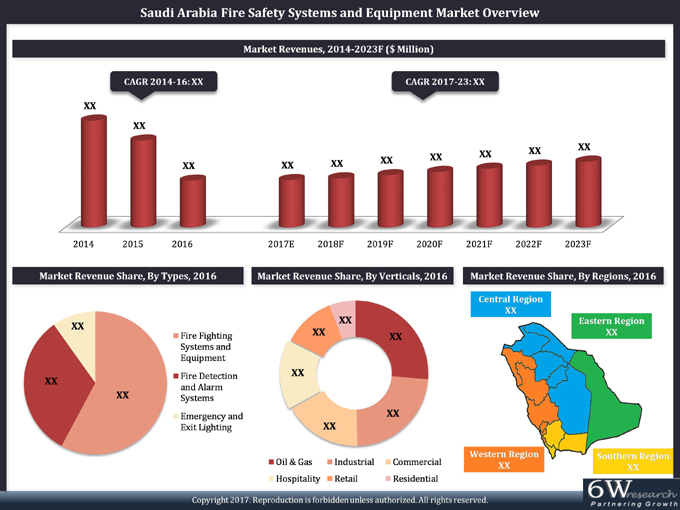 • Market Size & Forecast of Saudi Arabia Fire Fighting Systems and Equipment Market Revenues until 2023. • Historical Data of Saudi Fire Detection & Alarm Systems Market Revenues for the Period 2014-2016. • Market Size & Forecast of Saudi Arabia Fire Detection & Alarm Systems Market Revenues until 2023. • Market Size & Forecast of Saudi Arabia Fire Safety Systems and Equipment Market Revenues by Verticals until 2023. • Market Size & Forecast of Saudi Arabia Fire Safety Systems and Equipment Market Revenues by Regions until 2023.